Every customer is special. Whether you need to update the counter tops and backsplash in your existing kitchen, or you have a bigger dream of the complete make-over, Marble-Craft has the skilled craftsman and trade associates to get the job done on time and in budget. For over 12 years Marble-Craft has been the premiere source, in the Brazos Valley, for customers looking to upgrade their homes with granite and stone counter tops. We have a stunning array of over 275 color options for you to view, and we have a vast selection of edge profiles, and sink options to choose from as well. Marble-Craft has a synergistic alliance with some of the Brazos Valley’s best craftsman to enable the completion of your project, no matter the size. From tear out, to cabinets, painting, plumbing, flooring, and electrical, we have the ability to make your home look and feel new again. 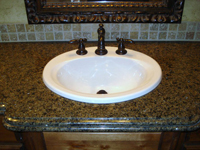 Since 1999 Marble-Craft has installed more countertops, bathtubs, and showers in Bryan-College Station and the surrounding Brazos Valley bathrooms than any other contractor in the area. We are the only Cultured Marble manufacturer/installer in the BCS area, and we have a long history of standing behind our products well after the initial project is complete. For the past 7 years Marble-Craft has expanded its operation to include complete bathroom renovations. We offer free design consultation, and can handle the entire project from demolition, to cabinets, flooring, painting, plumbing, electrical, and glass shower doors. 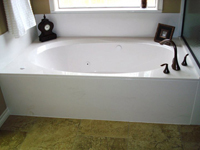 When it comes to maintaining the functionality of your home, Marble-Craft has the skilled technicians to provide service and repair to existing baths, without breaking your budget. We understand our customer’s needs to limit the inconvenience that occurs during the repair process; therefore we are committed to completing most repairs with 24 hours. Marble-Craft is committed to making your home, the home you’ve always dreamed it would be.